Spain's Constitutional Court has revoked Catalonia's parliamentary motion that set in motion a process of unilaterally breaking away from the rest of the country. Catalonia's parliament passed the resolution in November, aiming to establish a republic within 18 months. But the Constitutional Court has approved an appeal that was filed by the central government two days later. 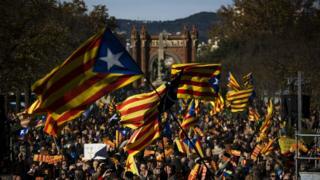 However, Catalan leaders have vowed to ignore the court's rulings. Their independence declaration calls for the Catalan government only to comply with laws that it has established. The Constitutional Court made one of its quickest rulings ever in order to come to a decision before the general election campaign begins on Friday, El Pais reported. Catalonia is a highly industrialised and populous region in Spain's north-east that accounts for about a fifth of the country's economic output.